Syriza established a system of patronage and nepotism. Alexis Tsipras appointed his cousin, friend and former business partner, Giorgos Tsipras, a mechanical engineer with no diplomatic experience, as Secretary General in the Ministry of Foreign Affairs. But putting Giorgos Tsipras in charge of Greece’s international economic relations was much more than a simple act of nepotism. Alexis Tsipras’ entrusted his cousin with a secret and lucrative mission. Alexis Tsipras came to power promising the end of nepotism. In fact it was one of Syriza’s main promises: “We entrust the fate of our people to the most able individuals”. ”The end of nepotism” lasted one day. Following Syriza’s victory in a snap legislative election, Alexis Tsipras was sworn in as Prime Minister of Greece for the first time on 26 January 2015. On the 27th his cousin, Giorgos Tsipras, was hired as adviser to the Minister of Foreign Affairs, responsible for Greece’s contacts with countries in Asia and the East. In April 2015, he was promoted Secretary General for International Economic Relations and Development Cooperation in the Ministry of Foreign Affairs. In short, Giorgos Tsipras became the official in charge of international economic relations within the ministry. Soon, Giorgos Tsipras’ appointment proved to be only the first in a long list of similar cases. Syriza established a system of patronage and nepotism. Children, spouses, siblings, friends and close party colleagues have all been granted high positions in the government and public sector without appropriate qualifications. It was not his resume that qualified Giorgos Tsipras for the job. He is a trained engineer, holding a degree in Mechanical Engineering from the National Technical University of Athens. He had no diplomatic experience, no skills or background in foreign economic policy. He was working as a columnist with the newspaper “Avgi”, which is a newspaper politically affiliated with Syriza, when his cousin put him in charge of Greece’s international economic relations. And it was not the Foreign Minister Nikos Kotzias who decided to appoint Giorgos Tsipras first as adviser and then as Secretary General. Giorgos Tsipras’ appointment was an act of nepotism. Cousin Tsipras was the personal choice of Tsipras the Prime Minister. Born in 1967, Giorgos is 7 years older than his cousin Alexis. Giorgos’ father Herakles and Alexis’ father Pavlos were brothers. Herakles (who prospered during the Greek junta years) was the eldest. Alexis and Giorgos Tsipras have been close friends since childhood. Aside from their close family relationship and physical resemblance, the two cousins also share a passion for politics from their youth. 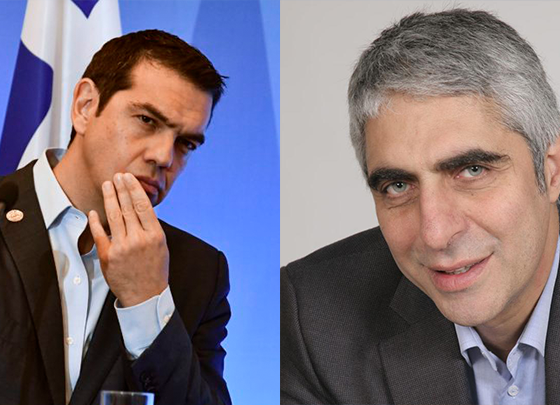 Both men started their political careers as members of KNE (Communist Youth of Greece). And they have done business together in the past. In February 2006, they became business partners, setting up a general technical company. Putting Giorgos Tsipras in charge of Greece’s international economic relations was much more than a simple act of nepotism. Soon after his designation, Giorgos Tsipras became a key figure within the Greek government. In September 2016, it was him who announced that the “government needs a broad reshuffle to get rid of heavyweight”. Not only that the Secretary General for International Economic Relations and Development Cooperation was in charge of organizing all the Prime Minister’s meetings with foreign investors, but cousin Tsipras took business trips without informing the Foreign Minister. Minister Kotzias learned about some of Giorgos Tsipras’ meetings with major foreign investors from the media. Giorgos himself admitted in July 2015, speaking with foreign media, that he was responding directly to his cousin, bypassing his superior in the Ministry of Foreign Affairs. Tensions grew between Nikos Kotzias and Giorgos Tsipras, and in October 2017, a few days before Alexis Tsipras’ official visit to Washington, the Foreign Minister gave an ultimatum to the Prime Minister: either Giorgos leaves the ministry, or Kotzias himself resigns. On 10 October 2017, Giorgos Tsipras resigned from his position. He was almost immediately appointed head of the Economic Office of the General Secretariat of the Prime Minister, a new position in the government created especially for him. Alexis Tsipras put his cousin in charge with the implementation of the government’s economic policy. Officially, during his term as Secretary General in the Ministry of Foreign Affairs, Giorgos Tsipras was around the world to raise money for Greece and lure investors. He failed in establishing trade relations and attracting investment. But Alexis Tsipras entrusted his cousin, friend and business partner with a special and very lucrative mission. It was a private assignment having nothing to do with Greece’s national interest. By the time he left the Foreign Ministry in October 2017, Giorgos Tsipras had accomplished this secret mission. One involving pipelines and a global energy company called Gazprom.